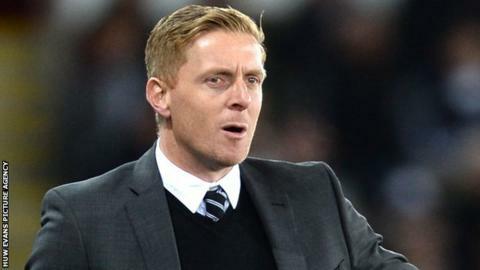 Swansea City manager Garry Monk admits he missed out on key targets in the January transfer window. The Swans failed to sign Norwich left-back Martin Olsson as they could not agree a fee with the Championship club. But Monk says he is "100% confident" his squad is good enough to finish the Premier League season strongly. "We wanted to add a bit more quality to help the quality we've already got. We tried, but ultimately we didn't get the players we wanted," said Monk. "We won't add players just for the sake of it. It has to be doable, it has to be affordable. "But we'll go with the players we've got, and I'm 100% confident we can finish the season strongly." Monk also backed striker Bafetimbi Gomis to put speculation about his future behind him and "make a name for himself" at Swansea over many years to come. "I've got 100% confidence in Bafe. I feel he can perform in the Premier League, that's why I brought him to the club in the summer," said Monk. Gomis was linked with several Premier League clubs, including Crystal Palace, and cast doubt over his own future when he complained of a lack of game time at Swansea. But Monk believes the Frenchman, who pledged his future to the club on social media, will emerge from the shadow of Wilfried Bony following the Ivory Coast striker's move to Manchester City for a fee that could rise to £28m. "It's been a difficult start for Bafe, I understand that. Wilfried was in such good form that it was difficult for Bafe to break in," Monk added. "He had his periods in between, but not enough for his liking, which is understandable. "But this period now is a good one for him. Hopefully he can make a name for himself and produce goals. "I can't stop speculation about him, the rumour mill will always go round, but Bafe is an important player for this club and hopefully that's the case for this season, next season and the season beyond that." Monk also said the club never had any intention of selling left-back Neil Taylor, another player strongly linked with moves elsewhere. "Of course I want Neil to stay," he said. "My only view was that he was the only recognised left-back at the club and we needed someone in that position to provide competition. "That was the only reason I wanted a left-back but people obviously put two and two together. "Neil was never going to be going anywhere."